This past offseason, the New York Rangers made the type of trade they and other teams should look to make more often. They traded a top contributor at the peak of his prime for a young player who has already done well in the NHL but still looks to be far from his career apex. The trade, of course, happened on July 18, when the Rangers shipped fan-favorite Derick Brassard and a seventh-round pick to the Ottawa Senators for center Mika Zibanejad and a second-round pick. Brassard had just lit the lamp a career-high 27 times, but at age 28 (at the time), he had likely hit the high watermark of his career. Zibanejad, meanwhile, was just 23 and had already eclipsed the 20-goal mark twice. The Senators wanted an established player to help in a push toward the playoffs, while the Rangers wanted a younger player with a high ceiling, but one who could also contribute immediately. For the Rangers, they were giving their team a new look in the present and making a clear improvement for the future. They could have doubled down and done the same with defenseman Kevin Klein, who had reached the peak of his career last season and the one before. They held on to Klein, however, and are now left to lament a missed opportunity. As one-time All-Star Dan Girardi began to decline over the past couple of seasons, Klein stepped up to help bring some stability to the Rangers’ defense on the right side. He proved to not only be a steady presence in his own end, but he added offense out of nowhere in 2014-15. Against all odds, the then-31-year-old duplicated that production in 2015-16. 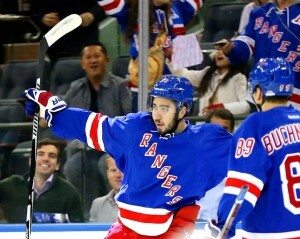 Klein tallied nine goals and 17 assists for the Rangers in 2014-15. After posting a shooting percentage of just 3.9% in the first 433 games of his NHL career, he suddenly skyrocketed up to 11.8% in 2014-15. It was an incredible jump for any player to make, let alone a career-long defensive defenseman who was on the wrong side of 30. Conventional thinking pointed to an expected downturn in those numbers in 2015-16, as the previous year appeared to be an anomaly. Enter the 2015-16 season, and it was deja vu all over again for Klein. He had the exact same points line as the previous season: nine goals, 17 assists, 26 points. This time, he actually shot at an even higher clip than the previous season: 13.0%. The opportunistic Klein continued to be an offensive weapon from the Rangers, using good instincts and a good shot. At this point, Klein’s value had to be at an all-time high. Like they did with Brassard, the Rangers could have looked to trade Klein to get some value before his production would slow and his overall play would suffer with age. A defender producing the way Klein was and incurring an annual salary cap hit of only $2.9 million likely would have been attractive to a number of teams looking to add one more solid veteran piece for a playoff push. Of course, that was attractive value for the contending Rangers as well. The problem is that the Rangers now appear to have squeezed all of the possible value out of Klein, and are left with a much less effective player who is on the books for another season after this one. Even though Klein loudly defied all statistical logic in 2015-16, things have come violently crashing down to earth this year (the stat geeks always get their way in the end). Klein has ZERO goals in 45 games this season. That equates to a shooting percentage of 0.0% (check out those math skills). Needless to say, the regression that was expected in 2015-16 simply arrived a year late, and emphatically so for the 32-year-old. The bigger problem for the Rangers is that Klein is no longer the reliable defender of yesteryear. He has appeared to be a step slower this season and often gets caught out of position in his own zone. He has been burned for such mistakes on a number of occasions this year, such as in a Jan. 14 loss to Montreal. Klein initially had his man, Brian Flynn, covered at the front of the net, but then went puck-chasing behind the net, vacating his responsibility in front. Naturally, it was Flynn who capitalized and potted an easy goal for the Habs. Klein’s decline has left the Rangers with a tenuous right side of their blue line, with the ever-shaky Dan Girardi eating up another big chunk of the minutes there. While they had to be enamored with Klein’s play over the previous two seasons, the Rangers could have had the foresight to realize this dip in play was inevitably coming, like it did with Girardi, who is also 32. The situation had become a perfect sell-high opportunity, but the Rangers missed out on it. Of course, it’s certainly possible that for all we know, the Rangers looked into trading Klein. But in the end, they did not pull the trigger on anything that might have been out there. Given Klein’s previous production and the Rangers’ clear win in the Brassard-for-Zibanejad trade, there is a good chance that they could have gotten some quality youth in exchange for Klein. Now, those chances seem slim at best.